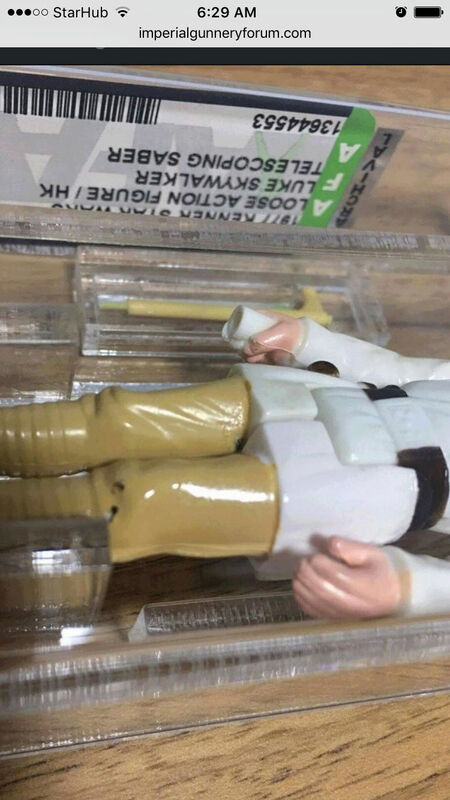 Manufacturers defect on dt luke Farmboys leg? Hi everyone, need your opinion on this figure. Has been graded an 85.it seems to have two punched holes through his knee. Is it a manufacturers defect? or is it physical damage? Have any of you seen any damage similar to this?? Are you sure that's holes in the plastic? It looks more like ink spots to me. If it is holes there is no doubt it would be considered playwear/damage as the figure was not made that way. 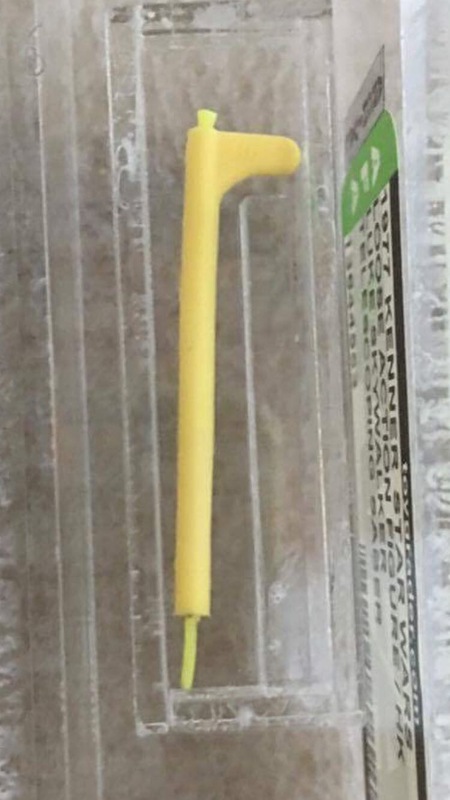 It would be near impossible for the injection plastic mold to still form the rest of the leg and knee if this had been a factory defect. This dt luke has a three line coo and letter HH on the sabre. Am concerned with the holes in his knee and some visible paint loss and damage on his right foot. Anything I should be concerned about? 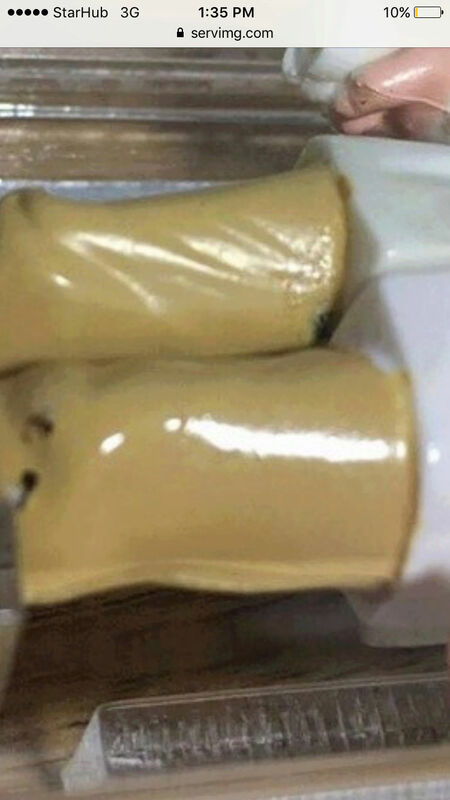 Those are definitely holes in the plastic, not ink. I'm wondering if it's physical damage of this extent, how can it be graded afa 85? The seller told me it's a manufacturing defect. Can a figure with two holes possibly be given an 85? Or is this an example of a afa fake figure? Maybe it's the camera flash or because it's inside plastic, but the colour of his pants look off and way too glossy. His foot looks like it hasn't been painted properly rather than wear. Paint apps where legs end under tunic is messy. Surprised AFA would grade something damaged with holes. The saber parts look different colours to me. Again, could be light from camera light. I'm certainly not calling this out as fake but something's not right. Be interested what others think. The pants is glossy. It's not the camera flash. I asked James and he said there was nothing wrong with it, until I spotted the holes. The sabre is lettered HH, but are the difference in Colours of the inner and outer Sabres really a cause for concern? I don't know honestly. The saber parts could be down to the plastic fading I guess. What are your thoughts on the foot? It looks like paint added to me or bad discolouration. You can see black marks as well as what look like smudges. I've not ever sent anything off to be graded (don't believe in it personally) but would it not be possible to contact AFA using the grading number to see if that number exists, what was graded under that number, and if they would grade something with these imperfections? Am about to pay for this so need you guys opinion on this. Are the two punched holes in the knee, plus the paint over job on his foot, plus the differing Colours on the sabre.. can it get an afa85? Or could this very well be a fake afa? As in serial number taken off a real afa piece, copied, and recased with a fake sabre and damaged figure? I reckon that the number is real, and is copied onto an imitation sticker. I agree that there is no way a figure with two 1mm holes will be ever graded a 85, This is not paint loss, they are holes. Looking at the further concerns brought up over this I would pass. 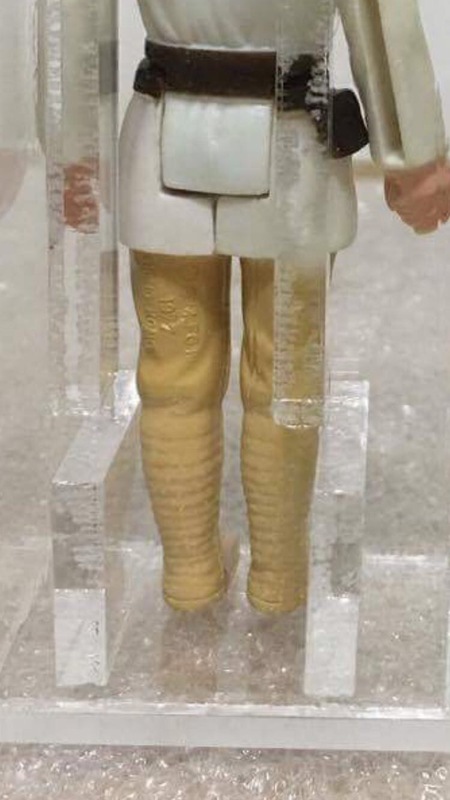 Maybe send afa the pics outlining the defect on the knee, possible foot retouch, and the saber and see what they say. It is possible the inner was paired with this outer at a later date as there was a large find of inners from the earth toy mall back in late nineties early 2000s (don't recall the exact date). But there is enough red flags I would pass in all honesty. Sent that to you in pm also. I don't know enough on graded figures to know if it is a fake, but for sure there is enough concern to warrant passing on it. Especially when seeing what appears to be touch up and sloppy paint. This is the most worrisome pic to me. Looking at that right foot it looks like there was either some black or brown paint on the foot that was cleaned off leaving a trace of it, or it is still there with a light coating of the pants paint over it. This combined with the knee issue is very questionable in my opinion. I absolutely agree with you. I don't feel comfortable about this, I have messaged afa regarding the different Colour Sabres, the retouched foot, the holes on the figure. Awaiting the reply. I can confirm the lighter/brighter inner saber is legit. They don't all have it but I have 3 DT lukes currently and owned a 4th. 2 of them (that I currently own) have a lighter/brighter inner saber compared with their more "solid plastic looking" outer. The glossy legs is fine too. In fact it's a good sign it's not been tampered with. some that i've come across where the owner has attempted to "clean" them often loose some of their shine. However this is not to say that non-shiny legs have been tampered with. The holes in the left leg is concerning. 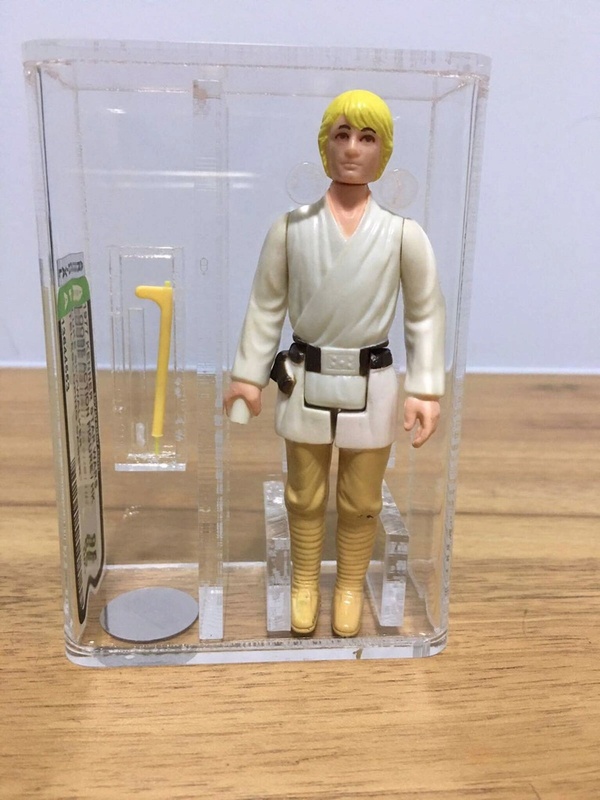 I've never seen that before on a farmboy Luke, and I currently own 14 including my DT's, varying coo's, hair colors and leg paint variations, and I have had many more go through my hands and would remember (or see it on my shelves) if that was a "normal" occurrence. The shape/dent in the knee is fine, that's molding, but the black hole is quite odd. 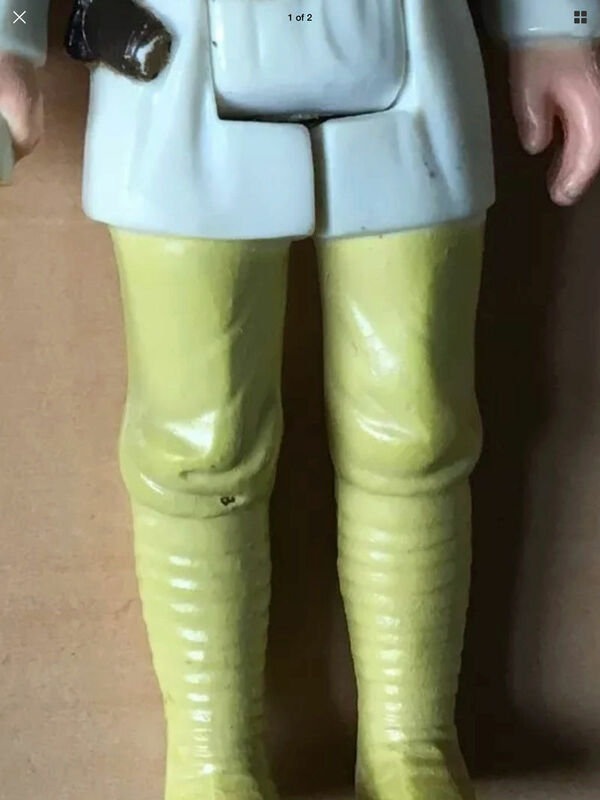 The other thing that struck me is that the farmboy legs are made of white plastic, not black as far as I've ever seen. So how did the black get there. Not being able to see it in person is hard but could there be an element of mis-applied paint involved? perhaps from the belt? The right foot looks a lot like play wear/scrape on the top, that's a common looking feature on these figures. Although again there are black flecks of what I assume to be paint - that is also odd. Perhaps the playwear was created by the figure being rubbed against a hard object painted black and some paint rubbed off onto the figure? again, hard to tell without seeing it in person. Hope some of this info/musings helps. I'm happy to provide images of my figures too if it helps. Thanks for the reply. I'm currently holding off this figure because there is simply no explanations for the two holes. Even normal playwear CANNOT result in these holes and I have played with many many toys from many Brands. I have never ever seen anything like it. 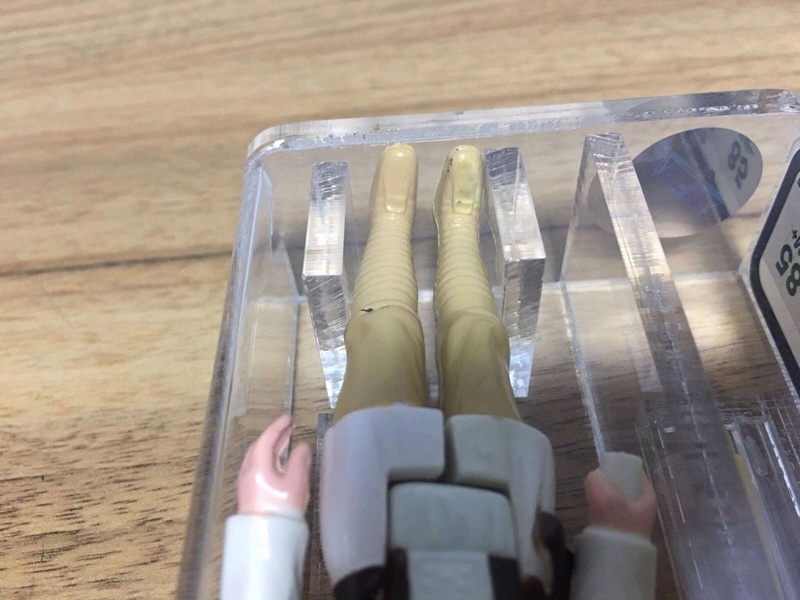 the seller said it's a manufacture defect but I understand froM The collectors Here that moulding defect cannot result in two deep holes, and the holes are black inside. 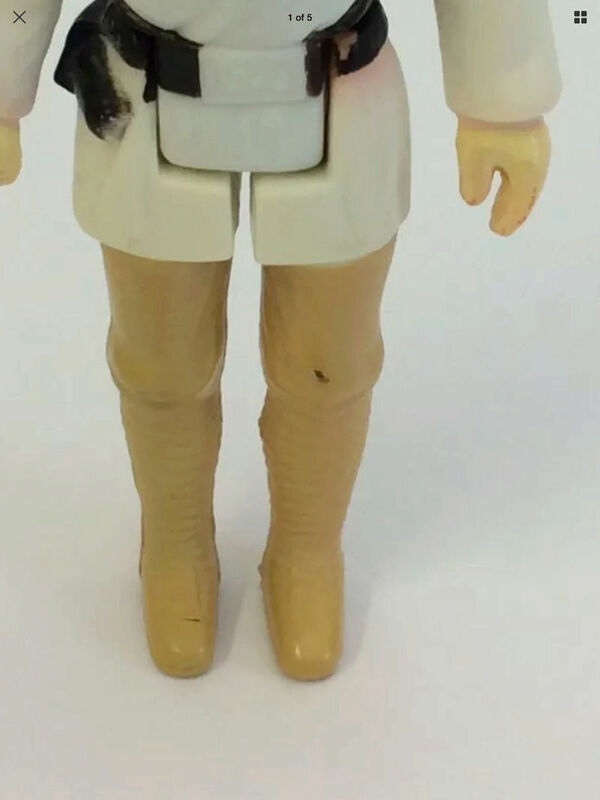 I also own three lukes and all are moulded legs with white plastic. The only explanation is that this is a fake afa case with a serial number copied off a legit copy. Even if there is a hole in the plastic, it should be white and not black. 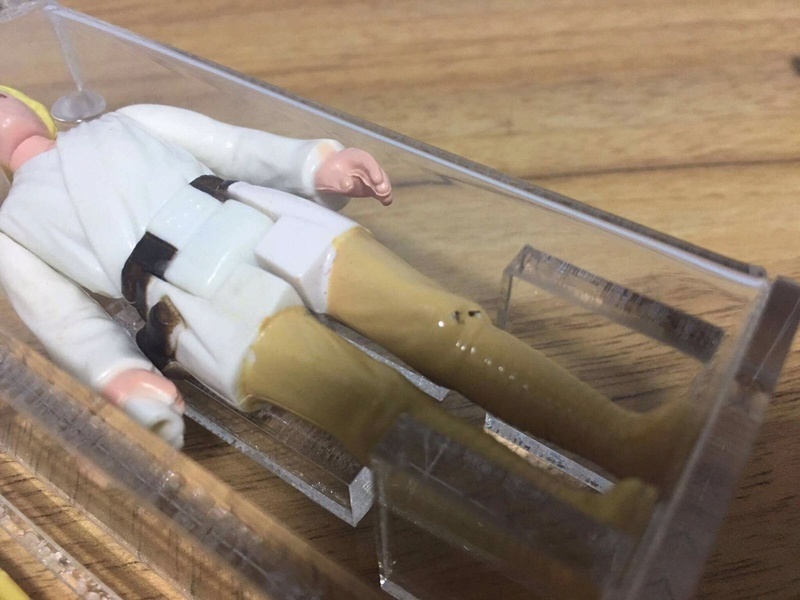 One thing though.. if supposing a person were to put it in a customised afa case with a fake sticker, they should have chosen a nicer luke figure without the holes in them. I have sent an email to afa awaiting their reply. Also, I just noticed the spot where his right leg meets the groin, there is an area of black paint. Any indication what that might be? Just did a search on eBay for active listings and recently sold listings. They don't look 100% like the holes you have there but it shows you can dark looking holes in the paint work. Wouldn't grade them 85% mind you. Yes thanks for the input!! The holes are extremely big. Nobody I asked would grade it an 85. I was actually coming to post this. No way that gets an 85 in this condition. 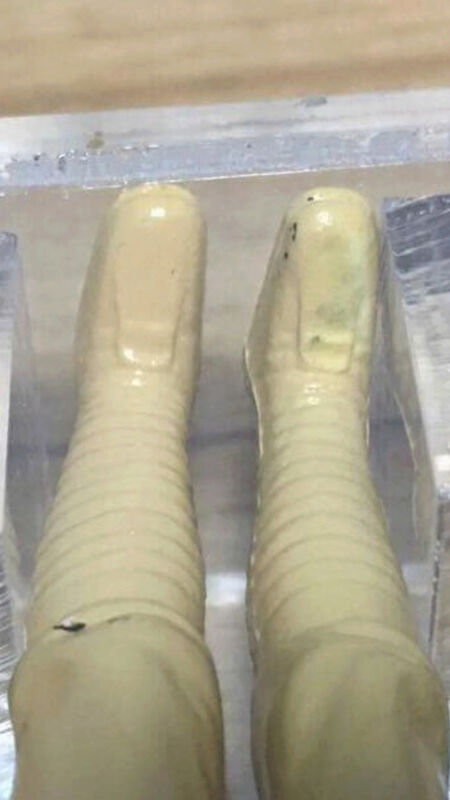 The only explanation that one could have for it is that it was stored in some place hot enough to cause the inside of the case to get extremely hot, causing possibly weak spots in the leg to melt and cause the holes. But if that were the case, wouldn't the AFA sticker have sustained some heat damage as well? This just doesn't add up for me in any way. It is unlikely that the figure was damaged by heat or impact after it is cased. 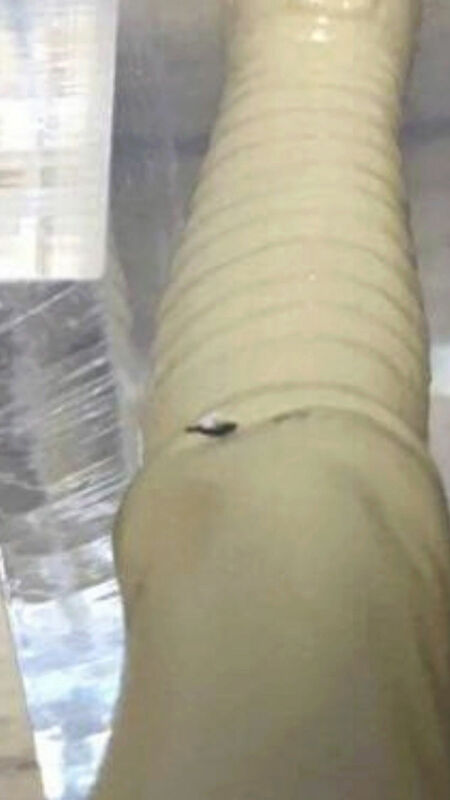 This defect was caused by an impact instrument. The case will be shattered. It's either afa is totally blind, or The case is a custom. I am surprised why do people treat all afa cases as genuine. Figures and weapons are much harder to copy than an acrylic case with a sticker. Even so, repro weapons and fake stormtrooper are plentiful. Of course it would. E pointless to encase a common figure yourself and go through the trouble of making a fake afa case. 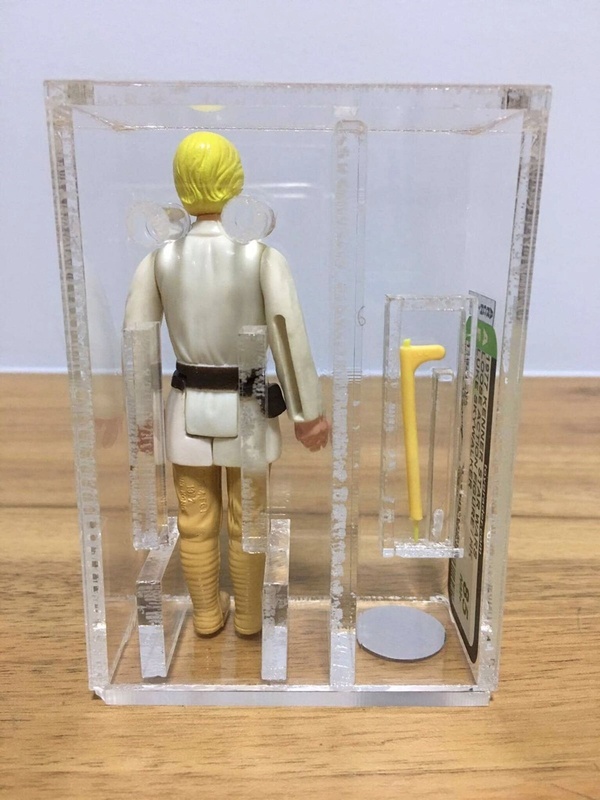 But a dt luke that is currently on sale for 2.5kUSD is worth the effort to make a repro afa case. 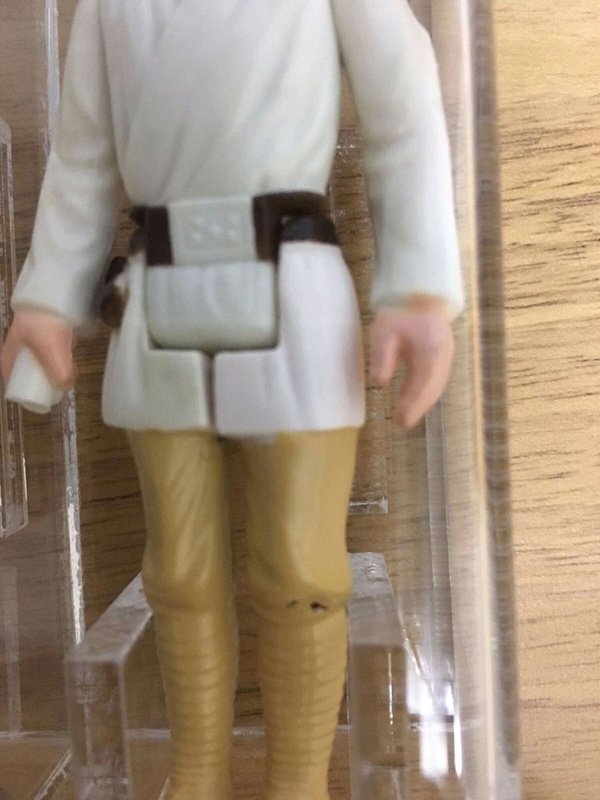 But even so... the maker should get a more mint looking luke to go with the afa85 sticker, so maybe just maybe afa really thought this was a manufacturers defect. This still doesn't explain the paint smudge on right foot and black plastic underneath. The only thing I can think to account for the black in various locals is retouch to the belt that was done so sloppily that the paint splattered or somehow got into the other areas. This would not have been caused by factory spray mask. I have seen sloppy factory paint but to reach under the leg or down to the foot is pretty extreme. Also are the dt Luke's really selling for $2.5k now? I collect loose and have seen loose ones in the $6-700 range but didn't know that graded was so much higher. I think afa85 ones are much higher than 75 or 80s. But more importantly, buying the figure is more important than buying the sticker grade. the grade only adds some comfort that the figure is real. But after seeing this, I think afa is questionable. I rather have a nice looking loose figure than a afa 85 graded figure with impact holes and black paint with touch up on foot. 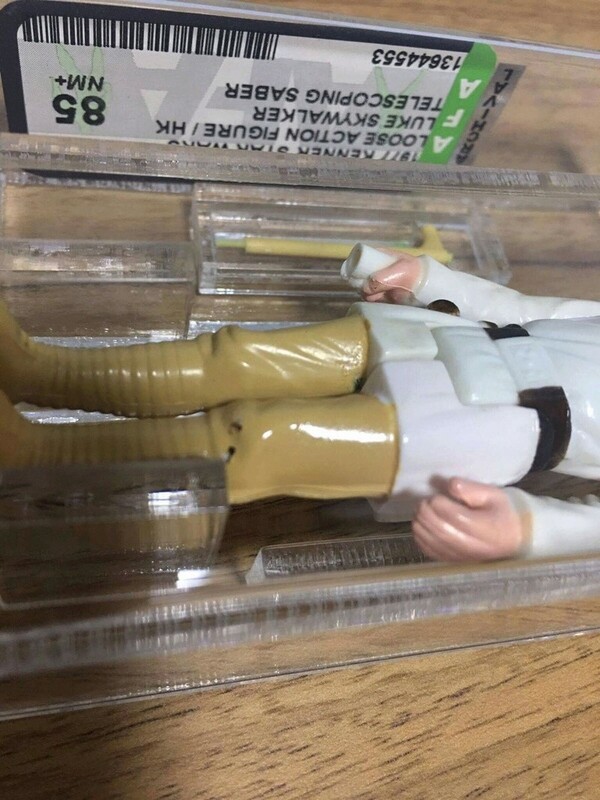 Subject: Re: Manufacturers defect on dt luke Farmboys leg?